I was blessed to see the Northern Lights or the aurora borealis as they are called, during my visit to northern Norway in early March this year. I was a guest at the Lyngen Lodge - a high end luxury lodge located far away from the city and about 500 km north of the Arctic Circle. The lodge with a wide open view into space, snow covered mountains and a glistening fjord provides a breathtaking setting for experiencing the Northern Lights. 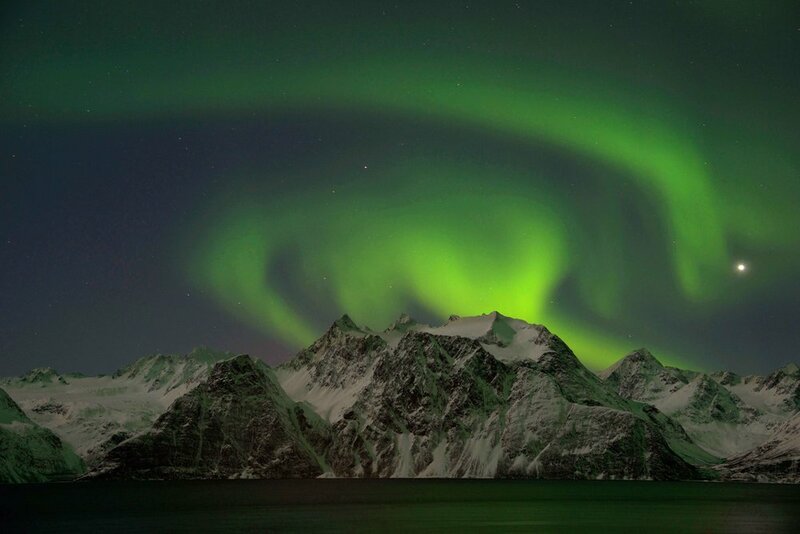 The lodge had arranged a photography session for the guests on how to shoot the Northern Lights. 1. A good DSLR camera even though my friend captured the northern lights on her iPhone, but the quality was not what you would get with a good camera! I used a Nikon D810. 2. A wide angle lens. I shot the northern lights with an 18mm-120mm Nikon lens with a minimum aperture of f4. It is even better if you can shoot with a 14mm-24mm lens with an f stop of 2.8 to get an even wider angle. 3. A tripod. You need a tripod for long exposure. 4. Shutter release. There is a certain amount of vibration caused from clicking the camera with your finger which is why it is preferable to use a shutter release. 5. And if you plan to stand meters deep in the snow shooting the lights, you need good boots, woolen cap and warm clothing - perhaps a thermal suit and definitely Arctic down gloves to keep your hands from freezing. 3. F stop (aperture) : the lowest your lens can offer, f2, f2.8 or f4 etc. 4. Shutter speed 10-13 seconds. However, since I am a creative person and don't like to follow rules, I experimented with different camera settings in different pictures. In some pictures I brought down the ISO to even 300 or 400 and increased the shutter speed to 20 or 25 seconds to compensate for the low ISO and get more light in. It all depends on what you like and how you want to shoot the lights. I always believe in listening to everything but in the end figuring it out for myself. The first rule is that there are no rules! I also zoomed into the lights instead of using a wide-angle setting to focus on the Arctic scenery I wanted in my frame and avoid junk like street lights etc. The lights start as a dim, palpitating fountain of flame and spread flickering over the stars in the night sky. I saw the lights on two consecutive nights, I was staying at the lodge. The first night the lights put up a spectacular show of muti-colored lights fluttering and dancing in ribbon-like patterns throughout the night sky. This show lasted 10 minutes. The second night the lights were paler and stayed the whole night long almost resembling searchlights flickering across the sky!